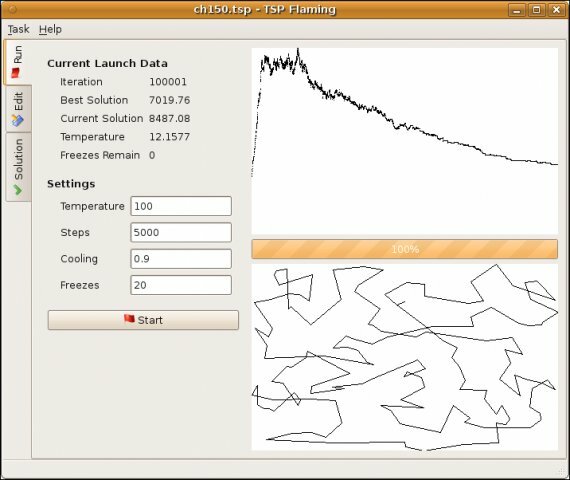 TSP Flaming quickly finds a good solution of the Travelling Salesman Problem using the method of Simulated Annealing. Given a map with cities locations, what is the least-cost round-trip route that visits each city exactly once and then returns to the starting city? Size of solution space is n!, where n is number of cities. The most direct solution rapidly becomes impractical. Instead of using exhaustive enumeration a generic probabilistic meta-algorithm is used. In fixed amount of time it finds a good approximation to the global optimum in a large search space. This is quite the confusing post. Version of libqtcore4 on system is 4.5.3really4.5.2-0ubuntu1. Version of libqtgui4 on system is 4.5.3really4.5.2-0ubuntu1. Do I wait for a package update, Ubuntu 10.01 to come off beta or a bug fix? Any thoughts welcome. I think it depends on what Video Card you’re using. a PC salesman). Runs with RHE, no problem. You tile is false. You should replace find with approximate…. otherwise P=NP, knowing that TSP is NP-Complete. Beside TSP is such a nice way to introduce people to computer complexity and simulated annealing is also quite a beautiful way to overcome such complexity!